A couple days ago, I attended the funeral of my great-aunt, the eldest member of my family tree. She was an amazing woman who lived a full and long life. As the rabbi and members of her family spoke about her, I began to think of the legacy she left behind and I realized that a good way to assess if you’re living the life you want to is to imagine what someone would say about you in your eulogy. What will they remember about you? What are the highlights they will touch upon? Is your career noteworthy enough to mention as one of your great accomplishments? Your charitable acts? Your kindness? The family you have created? What will you leave behind? I’ve thought a lot about my own funeral. I imagine this might be somewhat normal, when you’re faced with a life-threatening disease. But maybe not. I think I’ve always thought a bit more about death and such things than the average person. Six Feet Under is my favourite TV show, after all, and I don’t think that is exactly a coincidence. I’ve wondered what would be said about me at my funeral. The stories everyone would tell. I imagine who would show up – perhaps people from my past whom I haven’t spoken to in years. I like to imagine that it could be a happy celebration of life, but I know it would not be so. When someone young dies, it’s seen as a tragic event. We think of the person they could have become and the many things they wanted to accomplish. As much as I try to live in the present and not think about the many what ifs, I sometimes find myself consumed by the knowledge that I might not survive this brutal disease. The next few years for me are critical. And there are many people who have a recurrence many years down the road… 6 years, 8 years, 10 years. You get comfortable, and then BAM, you are told it is back, this time somewhere else in your body, and the situation is bleak. I hate that this is a possibility. I hate that because of my age and the genetic make-up of my tumour, my risk is higher. I am aware that the odds are in my favour, with all the treatment I have done. But the chances of an unhappy ending are still much greater than I am comfortable with. One of the hardest parts of thinking about all this heavy stuff is imagining the people I would leave behind. I can sometimes come to grips with the idea of me, myself, not existing anymore. But when I think of the pain this would leave, with my husband and with my family… well, let’s just say I try my best not to let my mind go there. I guess I should feel grateful that I’m loved and that there are many people who would like me to be alive. Most would say that’s a good thing. But the idea that I could destroy the happiness of so many people is a lot to bear. When my mind spirals down these dark places, I try to snap myself out of it: I say to myself, Don’t worry about tomorrow. I’m still here. Everything is okay today. Today, I’m alive. And then I move on and go on with my day and try to live a normal existence, the best I can. Tomorrow is my 19th treatment. 54 weeks of having drugs pumped through my veins. That’s a long time. But I’m hopeful that the drugs are doing their job and that my story will have a happy ending. Today, that’s what I feel like believing. 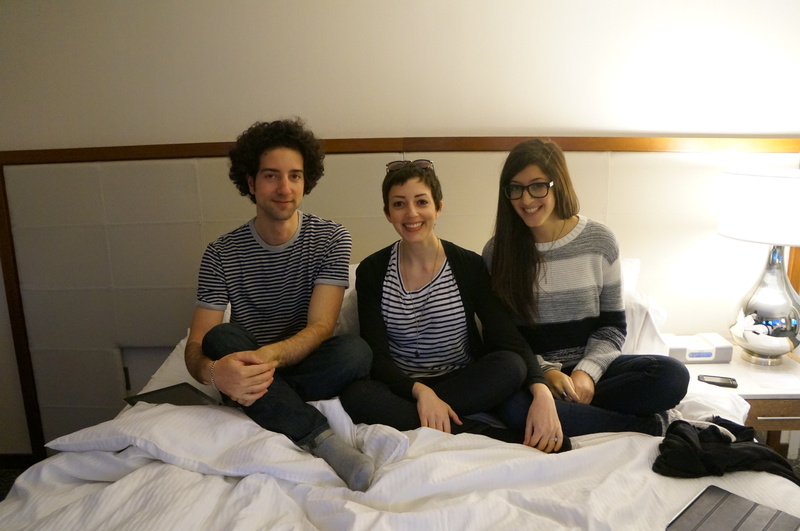 A recent pic with my siblings where we all, unintentionally, wore matching tops. The mind is a very powerful tool in your recovery, which I am sure you know. It can often challenge your sanity…..your stability…..your deepest fears…create deamons. You will celebrate your 96th like your aunt leah,because i said so! lv you uncle jack. You three are so cute! Nice picture of three of my very favourite students! Love your comment Ann — YOU were their favourite teacher!